SPEC INDIA/Blog/Why is Mobile ERP Solutions an Indispensable Ingredient in the World of Modern Business? Why is Mobile ERP Solutions an Indispensable Ingredient in the World of Modern Business? When we talk about ERP, the picture that comes before our eyes is a massive implementation of processes and software activities. It surely comes along with its share of challenges and hurdles but offers a great future – productive, efficient and profitable. Not just the IT department, there is a whirlwind wave of change that passes through each department. It attempts to changes things for the better. There is yet another feather added to its cap which has turned out to be indispensable for any enterprise – Mobile ERP Solutions. Combined with a power packed combination of two most happening innovations around the globe – mobility and ERP, these enterprise mobility solutions are set to rule the industry. With the whole world going mobile, it is evident to have this feature in ERP solutions as well. Enterprises have understood the fact that having mobile apps within ERP systems is the simple way to get a successful business. It does sound simple but needs a clear-cut roadmap and plan. This acts as a key booster to maximized organizational ROI. There is much to work on – business processes, key goals, technical aspects, costing, security issues, user aspirations. These key strategic facts play an important role prior to implementing any Mobile ERP solution. Missing any of these aspects could lead the entire effort into the drain. Why are Mobile ERP Solutions a Necessity? Enterprise Mobility solutions have proven their worth in touching each aspect of a company’s successful growth. Be it profitability, productivity, efficiency, effectiveness, customer relationships –Mobile ERP is here to stay. Look at today’s workforce, you will find most moving around. How can one expect them to be stationed at one place to use the software solution? Isn’t it always a better idea to have it on their mobile devices – instant, secure and affirmed? Also, with today’s employee force moving around, it is always a better idea to have all the information at the tip of the finger. 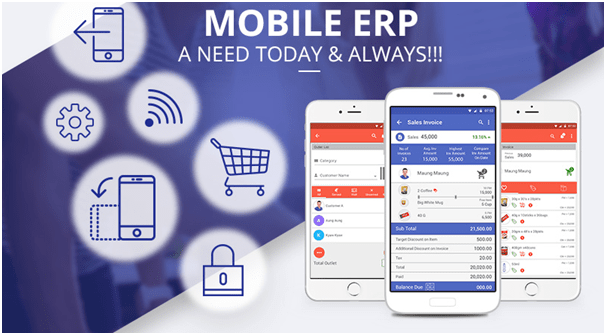 Mobile ERP solution is set to create a lasting impression on enterprises, influencing employee force as well as the customers. It makes sure there is a prompt availability of information. Detailed study of requirements is always the first and foremost step that is always a must for the success of any project. A step further, for a mobile ERP to succeed, it is highly crucial because there are certain aspects pertaining to the mobile interaction between different elements – people, departments, devices, offices etc. Anything that remains left out can lead to a direct implication of the downfall of the key success factors. Too many cooks spoil the broth – so rightly said. Taking too many things at a time can surely lead to a disastrous implementation. It is always wise to go in for a step by step implementation, in which elements that are linked together and needed first are taken on priority. Later, as the success is achieved, the remaining modules get attached on effortlessly, with a well thought of integration plan. This becomes an easy way out to manage the teams also, who are all new to the entire Mobile ERP- the new age ERP. No network, no solution. It is as simple as that. However sturdy, robust, scalable your solution is, if there is no network available, how will you leverage its potential? As an authority, the very first thing that needs to be assured is that there is a consistent and well-established network connectivity between the mobile devices at the optimum. Only then can we move ahead and ensure the success of the solution. With the solution going places, the very important aspect is the security of these devices and information. If we really want the solution to succeed, it is not possible to restrict usage of mobile devices or the solution itself. Securing them to the best is the only way out. There must be well-defined policies & procedures set up to ensure there is no security breach anywhere in any location, any device. Since there are many parameters involved in terms of infrastructure, hardware, processes, stakeholders, connectivity etc., it is preferred that a well-set testing process is in place before the solution goes live. Each little scenario needs to be emulated, tested, verified and okayed. Only then can we ensure that the solution in real life will function with minimal hiccups. As an Enterprise Mobility Solution Provider and a Mobile ERP Software Development Company, we @ SPEC INDIA have garnered visible experience in implementing Mobile ERP solutions all around the globe, including Fortune 500 companies. Have a look at our portfolio that showcases our proficiency in this arena. SPEC INDIA, as your single stop IT partner has been successfully implementing a bouquet of diverse solutions and services all over the globe, proving its mettle as a boutique ISO 9001:2015 certified IT solutions organization. With efficient project management practices, international standards to comply, flexible engagement models and superior infrastructure, SPEC INDIA is a customer’s delight. Our skilled technical resources are apt at putting thoughts in a perspective by offering value-added reads for all. We are looking for industry experts to contribute to our blog section through fresh and innovative content. MEAN Stack For Startups: What Does It MEAN For Startups? Introducing .NET Core 3.0 – Why Developers Are Excited About It?